The tenacity of concerns over obesity has been on the rise around the globe. And now, consumers endeavor on reducing extra fat that they carry, and consumption of healthy diet remains one of the key ways to achieve the same. Vinegar contains acetic acid that has fat-burning properties. The millennial population has been a forefront user of apple cider vinegar in various food products, which has been triggering the demand and sales for the product in the global market. 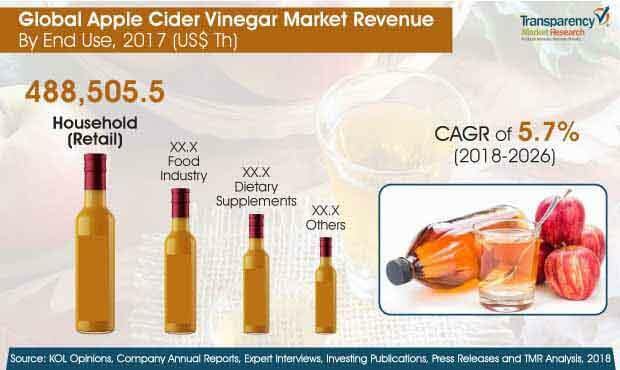 Revenue generated from the global apple cider vinegar market was valued at US$ 745.8 Mn by the end of 2017 and is expected to increase at a CAGR of 5.7% over the forecast period. The market are expected to be valued at approximately US$ 1,229.2 Mn by the end of 2026. Apples are one of the most widely cultivated tree fruits, and the third-most internationally traded fruit behind only bananas and grapes. Apples are commonly consumed, not only because of their flavor, but also because of the important nutrients that they contain, including high levels of antioxidants, vitamins, and dietary fiber. There has been significant growth in the consumption rate of apple flavored juices, sauces, as well as apple cider vinegar, which indicates that the confluence of consumer perception for apple flavored product consumption will help to drive the demand for the product in the global market. Consumers are inclining more towards a healthy lifestyle, which has led to the higher consumption of food and food ingredients with potential health benefits. Currently, consumers have become more conscious about their diets, owing to which, they are spending on a holistic approach to health and wellness that includes almost every aspect of life. Apple cider vinegar is one such food product which has several health benefits associated with its consumption, such as weight loss, improvisation of heart health, and helps treating diabetes. The rising awareness about the health benefits associated with the consumption of the product helps drive the demand for the product in the global market. However, some vinegars such as balsamic vinegar, red wine vinegar, rice vinegar, and distilled white vinegar have gained popularity among the target segments due to their easy availability at affordable prices. Moreover, these kinds of products provide additional health benefits for the target customers. Hence, there are other relevant reasons for consumers to prefer other types of vinegar over apple cider vinegar, which can result in a negative impact on the growth rate of the product in terms of value and volume sales. By type, the apple cider vinegar market is segmented into filtered and unfiltered. The unfiltered type segment is likely to be the most attractive segment in the forecast period owing to presence of mother in the product which stands of proteins, enzymes, and friendly bacteria that give the product a murky appearance. On the basis of form, the apple cider vinegar market can be segmented into powder, tablets, capsules, and liquid. The liquid segment is estimated to account for a significant revenue share of 87.6% in 2017 and is expected to register significant growth rate during the forecast period. By nature, the apple cider vinegar market is segmented into organic and conventional. The organic apple cider vinegar segment is likely to be the most attractive segment in the forecast period. On the basis of distribution channel, the apple cider vinegar market is segmented into direct and indirect. Indirect segment is further sub-segmented into store-based retailing and e-Retailers. Amongst these sub-segments, the store-based retailing is anticipated to occupy the largest market share of 80.4% in 2017. The e-Retails sub-segment is expected to register high growth rate during the forecast period. As indicated by regional analysis, the apple cider vinegar market in North America and Europe is expected to dominate over the forecast period followed by Asia Pacific. Asia is expected to become a prominent player by the end of the forecast period with a significant CAGR attributed to increase in the consumer awareness about the benefits associated with apple cider vinegar in the region. Some of the major companies operating in the global apple cider vinegar market are PepsiCo, Inc., The Kraft Heinz Company, GNC Holdings, Inc., White House Foods Company, Carl Kühne KG (GmbH & Co.), Castelo Alimentos S/A, Pompeian, Inc., Manzana Products Co., Solana Gold Organics, Aspall Cyder Ltd., Nutraceutical Corporation, Eden Foods, Inc., Higher Nature Limited, Vitane Pharmaceuticals, Inc., Bragg Live Food Products, Inc., Swanson Health Products, Inc., Mautner Markhof Feinkost GmbH, Viva Naturals, and others. Transparency Market Research offers an eight-year forecast for the global apple cider vinegar market between 2018 and 2026. In a recently released report by the company, the global apple cider vinegar market is expected to register a CAGR of 5.7% during the forecast period. The primary objective of the report is to offer insights on the advancements and opportunity in the apple cider vinegar market. The study demonstrates market dynamics that are expected to influence the current challenges and future status of the global apple cider vinegar market over the forecast period. This report also offer updates on trends, drivers, restraints, value forecasts, and opportunities for manufacturers operating in the global and regional apple cider vinegar market. Apple cider vinegar is simply a liquid vinegar that is made from apple juice. It is prepared by two fermentation processes. In the first process, bacteria and yeast are added to the apple juice to start the alcoholic fermentation process, and turn the sugar into alcohol. In the second process, the alcohol is converted into vinegar by adding acetic acid. It is used for various applications, and also in the management of various health conditions such as diabetes, weight loss, skin care, hair problems, low blood sugar levels, and many more. By type, the apple cider vinegar market is segmented into filtered and unfiltered. The unfiltered type segment is likely to be the most attractive segment in the forecast period owing to presence of mother in the product which stands of proteins, enzymes, and friendly bacteria that give the product a murky appearance. On the basis of form, the apple cider vinegar market can be segmented into powder, tablets, capsules, and liquid. The liquid segment is estimated to account for a significant revenue share of 87.6% in 2017 and is expected to register significant growth rate during the forecast period. By nature, the apple cider vinegar market is segmented into organic and conventional. The organic apple cider vinegar segment is likely to be the most attractive segment in the forecast period. Furthermore, on the basis of distribution channel, the apple cider vinegar market is segmented into direct and indirect. Indirect segment is further sub-segmented into store-based retailing and e-Retailers. Amongst these sub-segments, the store-based retailing is anticipated to occupy the largest market share of 80.4% in 2017. The e-Retails sub-segment is expected to register high growth rate during the forecast period. The report includes market share of each segment according to the region with analysis towards market trends respectively. A section of the report highlights apple cider vinegar demand. It also provides a market outlook for 2018–2026 and sets the forecast within the context of the apple cider vinegar ecosystem, including the new product developments as well as product offerings in the global apple cider vinegar market. This study discusses key trends contributing to growth of the global apple cider vinegar market, as well as analyses the degree to which drivers are influencing the global market. In the final section of the report, a competitive landscape has been included to provide report audiences with a dashboard view. Key categories of providers covered in the report are apple cider vinegar’ key players of the global apple cider vinegar market. Detailed profiles of the providers are also included in the scope of the report to evaluate their long-term and short-term strategies, key offerings and recent developments in the apple cider vinegar space. Key players in the global apple cider vinegar market includes PepsiCo, Inc., The Kraft Heinz Company, GNC Holdings, Inc., White House Foods Company, Carl Kühne KG (GmbH & Co.), Castelo Alimentos S/A, Pompeian, Inc., Manzana Products Co., Solana Gold Organics, Aspall Cyder Ltd., Nutraceutical Corporation, Eden Foods, Inc., Higher Nature Limited, Vitane Pharmaceuticals, Inc., Bragg Live Food Products, Inc., Swanson Health Products, Inc., Mautner Markhof Feinkost GmbH, Viva Naturals, and others. Also, another key feature of this report is the analysis of all key segments in terms of absolute dollar. This is traditionally overlooked while forecasting the market. However, absolute dollar opportunity is critical in assessing the level of opportunity that a provider can look to achieve, as well as to identify potential resources from a sales and delivery perspective in the global apple cider vinegar market.